We now have thirty-five walks, mostly in the Lake District. Browse our walks on this page or click on the map on the right to go to a clickable map showing our current walks in the Lakes. 1 November 2014: This short but fairly steep walk takes us from Wasdale Head up to the summit of Illgill Head, the higher of the two fells that sit above the famous Wasdale Screes. 15 December 2013: The walk from Hawkshead to Black Crag takes us past Tarn Howes to a splendid viewpoint, especially for Little Langdale, which is seen at full length. 27 October 2013: Today we add one of the quickest ways up Scafell Pike, via Lingmell from Wasdale Head. 16 June 2013: This delightful walk takes us up High Rigg, the fell between the valley of St John's in the Vale and the main Ambleside-Keswick road. 21 April 2013: Green Crag sits just back from Eskdale, and isn't really seen from the valley, but it it a satisfyingly craggy summit, with great views towards the upper reaches of the valley and the circle of mountains that run from Scafell to Crinkle Crags. 2 March 2013: This short walk visits a quiet lower summit at the western end of Eskdale, Redbrow Bank, familiar to many who drive over the fell road to Ulpha, but from the lack of clear paths rarely visited on foot. 12 January 2013: Our first walk for 2013 is an ascent of Binsey, an outlying northern Lakeland fell with great views along Bassenthwaite and towards Keswick and Borrowdale. 16 December: This walk takes us up Gowbarrow Fell, a great example of a minor fell with much more to offer than its height might suggest. 26 August 2012: This walk explores the north-western shore of Windermere, visiting Far Sawrey, and passing a series of small tarns (most notably Moss Eccles Tarn), before heading into the woods that dominate this area, eventually returning along the lakeshore path. 24 June 2012: Ullswater Steamer and Shore: This is a super walk, one of the best in the district, and it combines a trip on the Ullswater steamers with a classic walk along the southern shore of the lake. 13 May 2012: A more challenging walk, this takes us up Scafell Pike from Wasdale via Sty Head, Sprinkling Tarn and Esk Hause. 21 April 2012: This moderate walk takes us onto the summit of Sheffield Pike, the fell that divides the lower reaches of Glencoyne and Glenridding. 3 March 2012: This is one of the classic shorter walks in the Lake District, visiting Castle Crag, a minor peak, but in a fantastic location at the mouth of Borrowdale, and with views deep into the valley and along Derwent Water towards Keswick. 4 February 2012: This walk takes us to the summit of the Old Man of Coniston from Coniston village, but avoids the standard tourist routes. 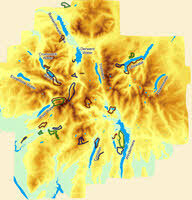 Instead we go via Goat's Hause and Goat's Water, and return via Dow Crag, giving us two great summits on a single walk. 15 January 2011: This is a short walk that begins with a trip on the Coniston ferry, before returning around the northern shore of the Coniston Water..
8 January 2011: This walk takes us to Latterbarrow, an excellent viewpoint for the northern part of the Windermere, starting from the pretty village of Hawkshead. 31 December 2011:This medium length walk from the Forestry Commission centre at Grizedale takes us out of the trees onto an area of unplanted moorland, before visiting Top o'Selside, a rare example of an unplanted fell in this area, and a great viewpoint. 20 November 2011: This delightful shorter walk takes us onto the low ridge of Muncaster Fell, at the entrance to Esk Dale. 23 October 2011: The circuit of Buttermere is one of the best low-level walks in the Lake District, and perhaps the best circuit of any of the lakes, combining some breathtaking mountain scenery with a comparatively short walk. 17 September 2011: Our next walk in the Peak District takes us into the less familiar upper reaches of the Dover Valley, above Hartington. 21 August 2011: This gentle medium length walk around Near and Far Sawrey visits one of the tourist 'honey traps' in the Lakes - Beatrice Potter's Hill Top, before heading off into an alternative Lake District of quiet roads and empty paths, all within a few miles of Windermere's crowds. 31 July 2011: Our third walk for 2011 is an ascent of Cat Bells from the side, avoiding the busy tourist path. 24 April 2011: After a longer gap than expected our second walk for 2011 takes us up Glaramara from Seatoller in the Borrowdale Valley. 22 August 2010: Walk ten takes us up Rannerdale Knotts, a great viewpoint on the edge of Crummock Water looking towards the Buttermere Valley. 11 July 2010: Walk nine takes us into Miterdale, a quiet valley in the western Lake District. 18 April 2010: Our eighth walk takes us up Brund Fell from Watendlath, an isolated side valley off Borrowdale. 5 December 2009: After a long gap we return with our seventh walk, in the Langdale Pikes. 3 May 2007: Our second walk takes us up Lose Hill in the Peak District, starting from Castleton. 14 September 2008: Sixth is a walk around Ladybower Reservoir in the Peak District. 4 October: Today we add our first walk, a climb to the top of Cadair Berwyn, as well as an article on the Berwyn Mountains.